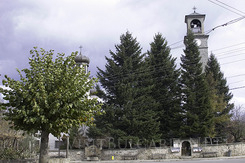 Dobrinishte is a synonym of alpine nature, mineral waters and a typical atmosphere of a Bulgarian village. This unique combination turns the rich in history village in an exclusively perspective mountain resort. The village is situated at the foot of the Pirin Mountain in the south- eastern part of the Razlog valley on 810 meters above the sea level. The village has a wonderful view towards the most beautiful part of Pirin. The guests of the village can also enjoy the healing properties of the local mineral water. Dobrinishte is 165 kilometers away from Sofia and 6 kilometers south of Bansko. The name of the village comes from “The good things”, which God gave to the people- the warm mineral springs, the forests and waters of Pirin. The village is known to exist ever since the Stone Age. A lot of Thracian and Roman pottery was found in the area, as well as coins from Neron emperor (I century before Christ). The swimming pool with mineral water known as “roman bath” is situated on the Dobrinishka river, where all the other mineral springs are situated. After the building of the lift that connects the village with Bezbog chalet it becomes the second important ski center in Pirin. Dobrinishte offers good conditions for advanced as well as for beginner skiers. The total length of the ski pistes in the region is 7 kilometers. “Govedarnika”- “Goce Delchev” chalet (for slalom) is 700 meters long, displacement 150 meters. 1700 meters and the lowest spot is 1550 meters, average inclination 22%. “Govedarnika”- “Goce Delchev” chalet (for giant slalom)- 1500 meters long, displacement 2010 meters and lowest point 1550 meters, average inclination 30%. “Bezbog” chalet- “Tuzlata”- “Gotce Delchev” (one of the longest pistes in Bulgaria)- 4700- 5600 meters long, displacement 700 meters with 2250 meters highest point and 1550 meters, average inclination 22%. The two final points are connected with a double seated lift with a capacity of 500 persons per hour and a middle station. There is also a ski- cloak room, ski- school for children- beginners and advanced in the region. Park zone “Bezbog” includes part of the “Ulen” reserve embracing Polegan summit and the circus of the Polejanski ezera (lakes). The park region also includes Bezbojko ezero (lake), Poppvo lake, the circus Samodivski lakes, Ribni lakes, Kremenski lakes and Kamelishki lakes. Dobrinishte is part of Bansko municipal. Major tourism sites are the church st. st. Peter and Paul (1835), as well as the Dobtinishki mineral springs. The seat lift to Bezbog chalet makes Dobrinishte the best starting position for National Park Pirin.